Note: This item may require a lens adapter and/or stepping ring to mount on certain cameras. 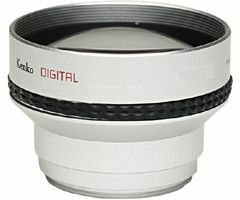 The Kenko KNT-20 is a 2.0x moderate telephoto lens with a 62mm mount thread. Features all glass optics, that are coated to reduce reflections and flare. The elements are housed in an all metal main barrel that will stand up to yaers of use. It is perfectly suited for digital still cameras as well as video and digital video camera.